These are standard city billboard advertisement structures. Currently includes 3 styles. Place the base object where you want the pillar of the billboard to touch-down. For this style, the direction in the filename represents the direction which the "pointy" part of where the two billboard sides meet points. Place the base object where you want the pillar of the billboard to touch-down. 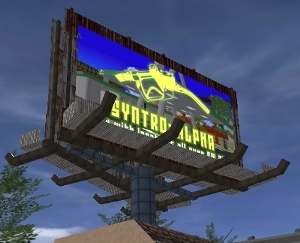 For this style, the direction in the filename represents the direction which the billboard is rotated. The actual billboard face will be facing 90 degrees clockwise from the filename direction. Place the base object where you want the center of the billboard to be. 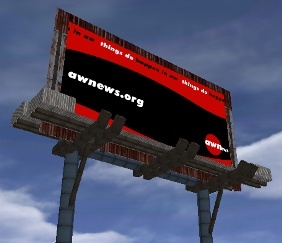 For this style, the direction in the filename represents the direction which the billboard is facing. To view more double-image advertisements to use for the billboards, view the Dual Image Ads directory. 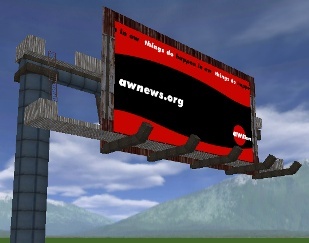 If you want the billboard to be higher up, place the base object in the sky and manually build the pillars to touch the ground.